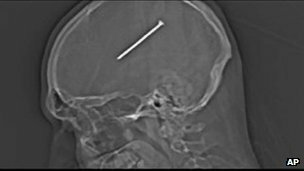 Dante Autullo, a suburban Chicago man accidentally shot a 3.25 in (8.25 cm) nail into his skull but is recovering after doctors successfully removed it from the centre of his brain. Dante Autullo, 34, was in his workshop when a nail gun recoiled near his head. The man had no idea the nail had entered his brain until the next day, when he began feeling nauseous. Doctors told Dante Autullo that the nail came within millimetres of the area used for motor function. Dante Autullo’s fiancee, Gail Glaenzer, told the Associated Press on Friday that he was in good spirits after the two-hour surgery to remove the nail at Advocate Christ Medical Center in Oak Lawn, Illinois. “He feels good. He moved all his limbs, he’s talking normal, he remembers everything,” she said. Gail Glaenzer said she had no idea the nail had entered his skull when she cleaned a cut on his forehead. The woman convinced him to go to the hospital after he felt nauseous for much of Wednesday. Dante Autullo thought that the nail gun had simply hit his forehead, but realized later that when the gun came in contact with his head, the sensor recognized a flat surface and fired. While there are pain-sensitive nerves on a person’s skull, there are none within the brain itself. Hospital spokesman Mike Maggio said the part of the skull that was removed for surgery had to be replaced with a titanium mesh amid worries that it might have been contaminated by the nail.